Rachel Cherry is a Senior Software Engineer for The Walt Disney Company with over ten years experience in back and front-end web development and digital design. Before Disney, she spent over nine years working in higher education and is the founder of WPCampus, a community and conferences focused on using WordPress in the world of higher education. 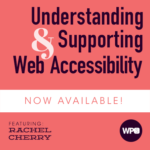 When she’s not using WordPress to help build the web, she enjoys promoting the importance of accessibility and working to encourage openness, collaboration, and professional development as a conference and meetup organizer. Rachel lives in Pasadena, California but you can find her on Twitter, GitHub, and bamadesigner.com.